For sceptics, believers, and everyone in-between. Making Sense of God shows how utterly necessary Christianity is, even if we won't admit it. Unconvinced by explanations of God? In an age of scepticism, can it really make sense to believe in Christianity's claims? We live in an age of scepticism. Our society places such faith in empirical reason, historical progress, and heartfelt emotion that it's easy to wonder: why should anyone believe in Christianity? What role can faith and religion play in our modern lives? In this thoughtful and inspiring book, pastor and New York Timesbestselling author Timothy Keller invites sceptics to consider that Christianity is as relevant now as ever. As human beings, we cannot live without meaning, satisfaction, freedom, identity, justice and hope - and Christianity provides us with unsurpassed resources to meet all these needs. Written for both sceptic and believer, Making Sense of God shines a light on the profound value and importance of Christianity in our lives. Making Sense of God by Timothy Keller was published by Hodder Paperbacks in September 2018 and is our 3211th best seller. 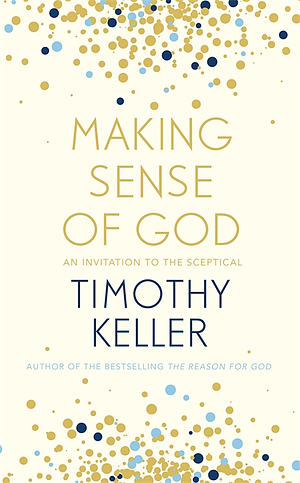 The ISBN for Making Sense of God is 9781444750218. Be the first to review Making Sense of God! Got a question? No problem! Just click here to ask us about Making Sense of God.